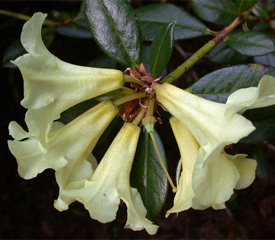 Flower/Truss Description: Funnel campanulate, 1" to 2" long, cream to yellow or greenish yellow, outside scaly, sometimes fragrant. Truss holds 4-6 flowers. Foliage Description: Leaves obovate or oblong-obovate, up to 3" long, dark or bright green, scaly. Height: 4 feet in 10 years.